A fascinating documentary that traces the miraculous lifespan of the obscure masterpiece known as Divine Mercy – the only painting of the Merciful Jesus that Saint Faustina Kowalska ever saw in her short life. 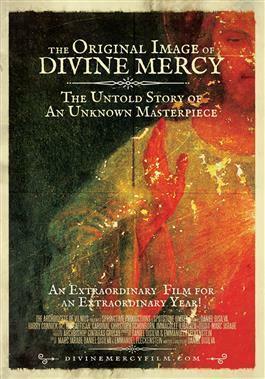 A timely documentary, endorsed by the Vatican’s Pontifical Council for the Promotion of the New Evangelization for the Holy Year of Mercy, The Original Image of Divine Mercy features key witnesses to the mysterious case of the unknown masterpiece and exclusive commentary by Bishop Robert Barron of Los Angeles, George Weigel (biographer of Saint Pope John Paul II), comedian Jim Gaffigan, Grammy award-winning musician Harry Connick Jr., Cardinal Stanislaw Dziwisz of Krakow, Cardinal Christoph Schönborn of Vienna, Fr. Michael Gaitley MIC, Fr. Karl Wallner of the Monks of Stift Heiligenkreuz in Austria, Fr. Dwight Longenecker, and many others. A team of artists, researchers, and interpreters, travel through Europe and the United States to speak with some of the most knowledgeable and "connected" people surrounding the priceless Kazimirowski masterpiece in the hopes of finally uncovering the details to the many unanswered questions about the little-known Original Image of Divine Mercy. At the request of Jesus Himself, Saint Faustina and her confessor, Fr. Michal Sopocko, worked tirelessly with a relatively unknown artist (Eugeniusz Kazimirowski) to render on a canvas her mystical vision of the Merciful Jesus. After 6 months of working in secret, and with all the corrections and touch-ups insisted upon by Saint Faustina made to the work of art, the three unlikely friends came up with the only Image of Divine Mercy that Saint Faustina ever saw in her lifetime. But after 6 months of working on the painting, the violently anti-Catholic Soviet occupation of Vilnius (Lithuania) forced the painting into hiding. From there it was smuggled, sold, abandoned, forgotten, stolen, until finally, almost 70 years of wandering, the miraculous painting was bravely transported back across the dangerous border between Lithuania and Belarus by two humble nuns so that the painting could finally be restored and, according to the wishes of Jesus made known to Saint Faustina, placed above the altar of a "beautiful shrine" in its original and now permanent home in the City of Mercy, Vilnius.